A simplified path to building high compliance apps. Heroku Shield is a set of Heroku platform services that offer additional security features needed for building high compliance applications. Use Heroku Shield to build HIPAA or PCI* compliant apps for regulated industries, such as healthcare, life sciences, or financial services. Heroku Shield simplifies the complexity associated with regulatory compliance, so you can enjoy same great developer experience when building, deploying, and managing your high compliance apps. Learn more about Heroku’s compliance programs and certifications by visiting our compliance center. Heroku Shield is available to Heroku Enterprise customers as an additional package. Your Heroku Shield apps run in your own network isolated Heroku Shield Private Space using Shield Private Dynos to further enhance security at runtime. You have the option to add Shield Postgres for highly-compliant data management and Shield Connect to safely sync data between your Shield apps and Salesforce. 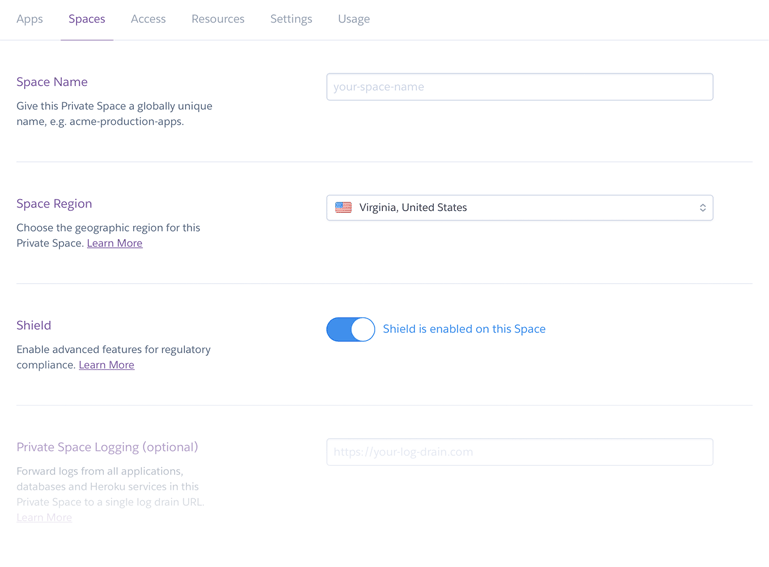 In addition, Heroku Shield gives you enhanced trust controls, such as Private Space Logging, that greatly simplify compliance auditing while still giving you full control of app configuration and deployment. Why build with Heroku Shield? Simplify the complexities of regulatory compliance. Build engaging healthcare apps, fintech apps*, or life sciences apps with secure data services and meet complex regulatory requirements, including HIPAA and PCI*. Spin up a HIPAA or PCI* compliant environment in minutes and start deploying your apps with all the ease of the Heroku developer experience using git push heroku master. Get additional trust controls, such as: keystroke logging for production access auditing, logging at the space level that you control, encryption at rest for ephemeral data, and strict TLS enforcement. Extend your CRM capabilities to your Heroku apps and safely share PII data or PHI data with your Salesforce instance, including contacts, account data, and other custom objects. At Heroku, trust is our number one value. Learn more about Heroku’s compliance programs and certifications by visiting our compliance center. A suite of services with enhanced trust and security. See how Heroku Shield helps developers solve many of the challenges of HIPAA compliant app development. Learn how to configure a compliance-ready environment and data center in the cloud using Heroku Shield. Heroku Shield, a new addition to our Heroku Enterprise line of products, offers developers the power and productivity of Heroku for strictly regulated apps. Heroku’s PCI Level 1 Service Provider designation* helps our customers understand how Heroku's systems and human processes work together to safeguard customer data. *Important note: Heroku Shield Connect is currently not PCI compliant. If you require bi-directional, PCI compliant sync between Heroku Postgres and Salesforce, please contact us and we can help you find the right solution for your needs.